The Oakland Public Library is writing about us again. Over five hundred books and counting, not to mention the hundreds of books donated to your public libaries across the nation. I have been getting the best email from those of you who have seen the book at bookstores, or who already devoured the book to make way for Harry Potter. Some of you have written to ask if it matters where you buy the book. No. It only matters that you buy it. It’s great if you ask your local bookstore to order it, so that more copies ship out. And it’s wonderful if you have your libraries order it. But the most important thing for a little nobody like me is that people buy the book. Recommend it for your book clubs, tell your friends about it, use it for a gift excuse. There’s also this silly e-postcard you can send around. In any event, I’m flattered that so many of you want to help my one-woman publicity machine, and with any luck this book will go to a second printing. Thanks for spreading the word and for helping me out. I broke the 500 mark on Amazon sales ranking today, and that makes me feel like a rockstar. Thanks. Because the books finally arrived at my house and since I’m gearing up for the busiest summer of my life, and seeing as how I just got back from 24 hours in Vegas — I’ve caught a cold. It’s one of those nasty exhaustion colds where your spine aches and you feel like you’re floating above everything. I’m wiped out. 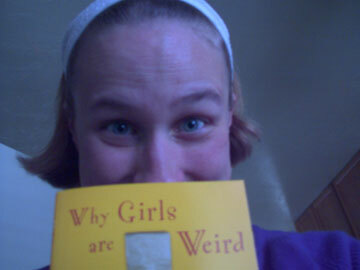 I haven’t been able to go to the Post Office to mail off copies of Why Girls Are Weird to people who have been expecting them. But my book did take its very first tour. This is my box. I love this box. 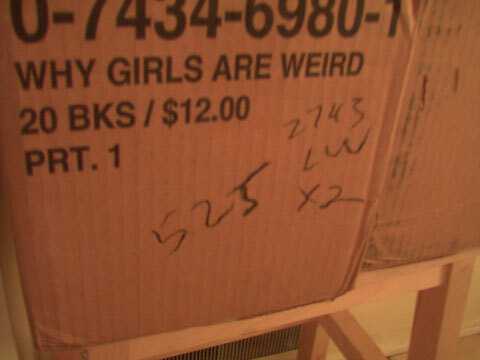 I love that there’s a machine somewhere that prints the title of my book on boxes. And since I’m about to have to move in a month or two, I really could use about fifty of these boxes to move my bookshelves of books. But look how pretty the box is. So official. 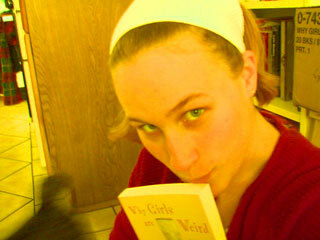 That right there was when I realized I totally wrote a book that was shipping to actual bookstores. I’m pretty excited about it. So excited I’ve turned some kind of Willy Wonka shade. Almost as much as I love Photoshop. I’m sick, so my cute, sassy hair is on holiday today. That blur to the left of the picture is Cal, sick of me and my box love. Taylor is busy reading the book to see if he has grounds to sue. 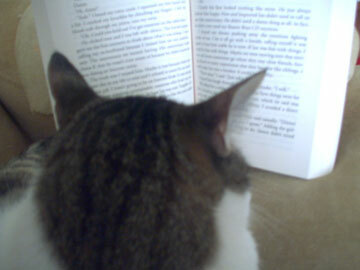 He’s a pretty slow reader, though, so I have a few days before I have to worry about anything. 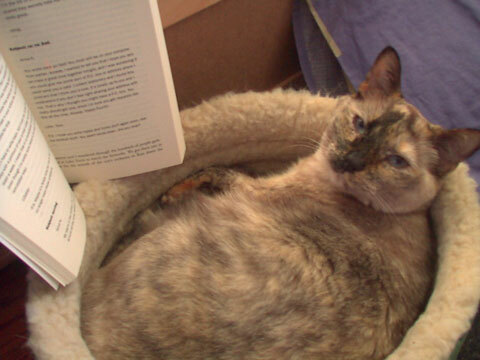 Olive is rather upset that she isn’t represented in the book and thinks that for a first time novelist, I could have worked harder to find a way to transition the story from a website to a literary work without it being so obvious. She thinks my characters are just thinly-veiled pseudonyms for people in my real life and I didn’t explore enough of the moral dilemmas journaling in today’s society creates for the average writer. She wishes I talked more about whether journaling is the same thing as being a writer, and she doesn’t appreciate the way I wrote Say Anything without its included ellipses. 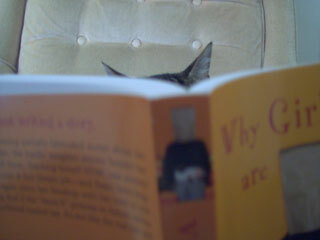 Olive stopped reading after the fifteenth page. 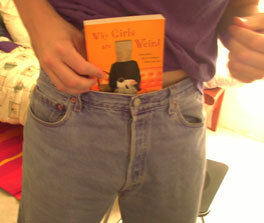 Stee put the book in his pants. My most self-indulgent photo, but really, this is what it’s all about. 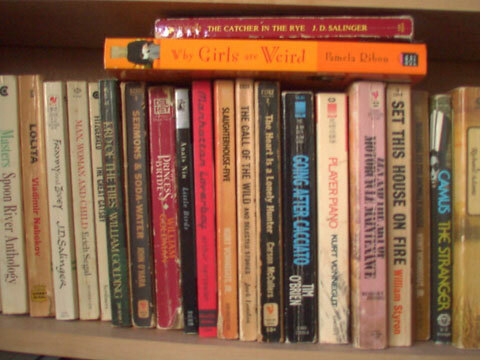 Sure it’s awkward and gawky and doesn’t really blend in with the other well-worn loved classics, but it’s there. It’s Queer and It’s Here! GET USED TO IT! Candy and Me: A Love Story, by Hilary Liftin. I devoured this candy memoir with a package of Twizzlers. I’m not that much of a candy freak (give me potato chips or french fries instead, the Polish girl in me craves potatoes 24 hours a day), but my boyfriend loves candy so much that candy could file a restraining order. It made me understand him just a little bit more, and realize his addiction isn’t a choice, it’s a disease. For the record: my favorite candy flavors are strawberry and purple. Shoot Out: Surviving Fame and (Mis)fortune in Hollywood. This feels like work, so it’s taking longer to read. Next Article …and I’ve Bitten Off All My Nails.